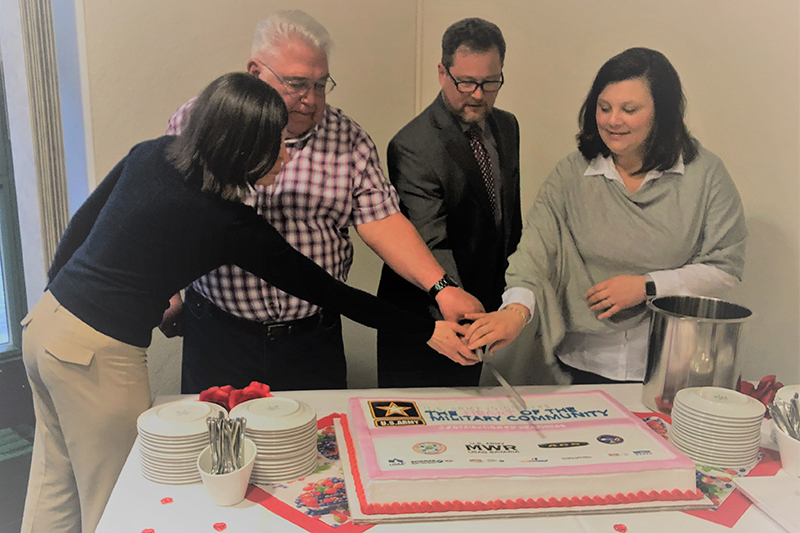 Morale, Welfare and Recreation Manager Elena Smeltz, left, William Notz, Retiree/Civilian Volunteer of the Year, Sean Lehane, Deputy Garrison Manager – Garmisch, and Rhonda Roseberry, Family Member Volunteer of the Year, cut the cake at this year’s Volunteer Recognition Ceremony, April 4, on Artillery Kaserne. GARMISCH, Germany — U.S. Army Garrison Bavaria – Garmisch community volunteers were recognized for their commitment and support during the annual Volunteer Recognition Ceremony held April 4 on Artillery Kaserne. From March 2018 to March 2019, volunteers in the Garmisch community donated more than 6,500 hours of their time, which equates to a cost savings of over $161,500. Throughout the ceremony, Deputy Garrison Manager Sean Lehane highlighted the essential role that volunteers have in the local community. “In my opinion communities are measured by how involved its members are, and I think you all have shown that our small community measures pretty high,” said Lehane before handing out this year’s awards. Rhonda Roseberry was selected as the Family Member Volunteer of the Year. She was nominated by the Garmisch Elementary/Middle School Parent Teacher Association. William Notz, nominated by the Postal Service Center, was selected as the Retiree/Civilian Volunteer of the Year. Preston Lee, selected as the Host Nations Volunteer of the Year, was nominated by the USAG Bavaria-Garmisch Chapel. Volunteer opportunities, managed by Army Community Service, come with many benefits. Volunteers can learn new skills by exploring different career options, add experience for resumes and make new friends in the Garmisch community. The Volunteer Management Information System tracks volunteer hours for the annual volunteer recognition ceremony. If you would like to volunteer, contact the ACS coordinator at DSN 440-3572, CIV 08821-750-3572.